Add a second telephone line with the same great calling plan just an additional $15 per month! Customers who purchase U-verse TV service with Internet service on a combined bill will receive an unlimited usage allowance. That’s a $30 value at no additional charge as part of the discount! This is only available for AT&T Internet, not DSL or Fixed Wireless Internet. Add a second telephone line with the same great calling plan, just an additional $15 per month! AT&T Internet 24 lets you take speed to a new high! Internet 24 from AT&T gives you download speeds up to 24 Mbps , you can enjoy keeping up with friends on social media, streaming videos and movies, video chat, or download big files on up to 3 devices without getting bogged down! With 1 TB of data per month you can keep on going. With 1 TB of monthly data, you may never get even close to capacity. Completing the deal are multiple protection features to ward off viruses, adware and spyware. 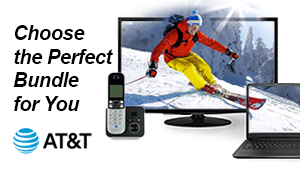 Save when you bundle with AT&T by calling today.